This we will start once mutton has been marinated for at least 2 hours. Wash rice nicely and put it on boil in a pan. Add jeera. Now, we will make a Potli Ka Masala. Why? Because what we want is to get all the flavors of whole masalas but not the whole shells in our mouth when enjoying Biryani. For this, take a muslin cloth and make a tight knot with all the whole masalas as mentioned in Ingredient # 6. Put it in the rice. We need to cook rice only till half way as rest of the process will be with mutton. Now using a ladle, start making a layer of rice over mutton in the patila. It's okay to have little water coming along as it will keep the Biryani nice and moist. Don't put all the rice as we will make 2 layers. Once one layer is done, sprinkle garam masala, nutmeg powder, browed onions, kewada water, Gulab Jal and kesar mixed in little milk. Also, add desi ghee on the layer. Add another layer of rice and add same ingredients again. If you have more rice, make one more layer. Now melt some desi ghee, a good amount actually and pour it on the inner walls of patila. Pls be generous as ghee needs to go deep down to help cook mutton and make the Biryani moist. No kanjoosi here!!! 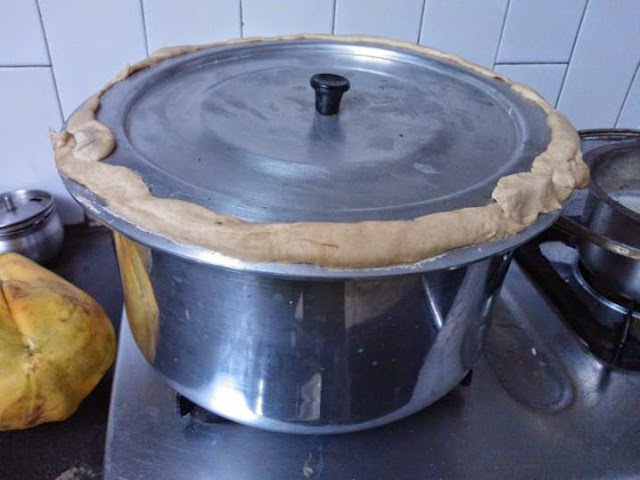 After layering, seal the patila nice and proper with the dough with the lid on as you can see in the picture above. Ensure there is no space for steam to come out when it's cooking. Once sealed, first cook it on high for 10 minutes and then cook it for around 1 hour on low. This sealed system will cook the mutton and rice in its own steam (DUM). Once done, cut open the seal, mix the Biryani well. Your Biryani is ready. Garnish it with coriander and serve it with Jeera Raita or Mirchi Ka Salan. Anyway, now I want you to leave your comments below and subscribe to my blog via email to get more out of the world recipes like this. Biryani looks yummmy...i love al ur recipes!! Thanks Ketz. I hope you liked the site and easy navigation. BTW, did you subscribe to my blog via email? Hi.. looks mouthwatering! when and where do we use hung curd?